Syncing Offline Sales in Vend – How can we help? If your device disconnects from the internet while you are using Vend, any sales made offline will need to be synced the next time your device is reconnected. You will know when offline sales are syncing as small circular arrows will be rotating below your Vend register name. This should happen automatically within a minute or two of your device reconnecting to the internet. 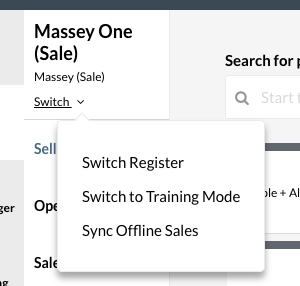 If it does not, however, click on the drop down arrow and select "Sync Offline Sales" option, to sync your offline sales immediately. If this section is showing "View Error(s)" instead, it means that some of the sales that you have made were not successfully synced to the Vend. Important: It is crucial that you do not clear your browser cache if you receive an errored sale. Doing so will clear any unsynced sales and render them unrecoverable. Clicking on "View Error(s)" will bring up a list of these errored sales. 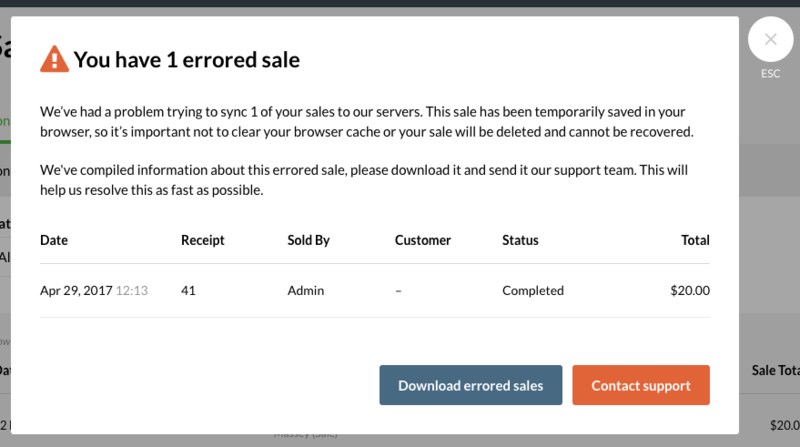 If the latest sales sync failed because your store was disconnected from the internet during the sync, you will have the option to resync sales. If Vend detects a problem with the sale itself, even after internet connectivity has been restored, you will be asked to download a CSV of this errored sale and send it to our support team.